Kealia means "the salt bed" or "the salt-encrusted area." In former times flat, low-lying shoreline sites were periodically flooded by high surf and high tides. Shallow ponds would often form. After several days of exposure to the sun, the water that had inundated the flats would evaporate, leaving behind a thin layer or occasionally a pocket of salt. Salt from the deeper pockets was gathered to satisfy a variety of domestic, medicinal, and ceremonial needs. The name Kealia, or a form of the name, is found on all of the major Hawaiian islands, including Niʻihau and Kahoʻolawe. Kealia was once a plantation town with a sugar mill and a train depot. An interisland steamer landing was situated at the north end of Kealia Beach. Little remains of the former town. Today, sugar cane from the surrounding fields is trucked to a mill in Uhuʻe, and the bulk sugar produced by the mill is shipped out of Nawiliwili Harbor. The only major commercial activity in Kealia today is sand-mining of the extensive dunes just inland of the highway. These are the only significant dunes left on the windward side of the island since the extensive dunes in Waipouli and Kapaʻa were leveled for development. 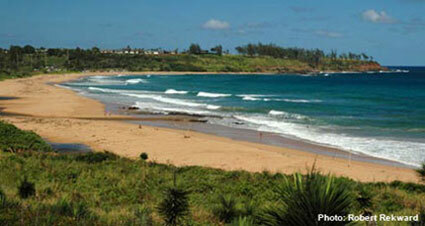 About 150 feet wide and half a mile long, Kealia Beach lies between two rocky points. The nearshore bottom is a long sand bar whose depth constantly changes. Surf breaks on the sand bar throughout year, attracting a constant flow of bodyboarders and surfers. Most of these wave riders tend to congregate at the north end of the beach, where the best waves are usually found. High surf during the winter and spring on KauaʻI's north shore wraps around the island and breaks at Kealia. It often undermines the sand bar, exposing the bedrock below. During these periods of high surf, nearshore rip currents are very powerful and dangerous. Over the years many drownings and near-drownings have occurred here. At the north end of the beach, a small jetty offers swimmers some protection from the surf. The jetty is all that remains of the former Kealia Landing. The beach is easily accessible from Kuhio Highway. Beachgoers unfamiliar with the area should be aware that they must cross a cane-haul road parallel to the highway in the rear of the beach. Heavy trucks laden with sugar cane use the road whenever fields are being harvested to the north of Kealia.